1205W series Bi-Color Red/Yellow SMD LED from Stanley features 2 independent LEDs in a single surface mount package. Maximum forward voltage 2.0VDC (Red) and 2.5VDC (Yellow). Forward current is 30mA. Peak Forward Current (Pulse Width ≤1ms, Duty ≤1/20) is 70mA. Power Dissipation is 75mW. Luminous Intensity (@20mA) is 40mcd (96 mcd max). Dominant Wavelengths are 647 nm (Red) and 572 nm (Yellow). Material is GaAlAs (Red) and GaP (Yellow). Surface mount package with overall size of 3.2mm long x 2mm wide x 1.5mm tall. On tape and reel. 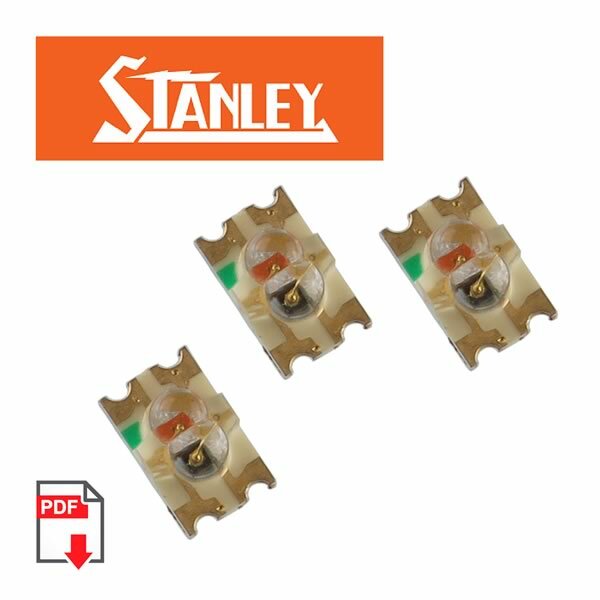 Stanley Part# BRPY1205W-RR. Sold in a package of 20.